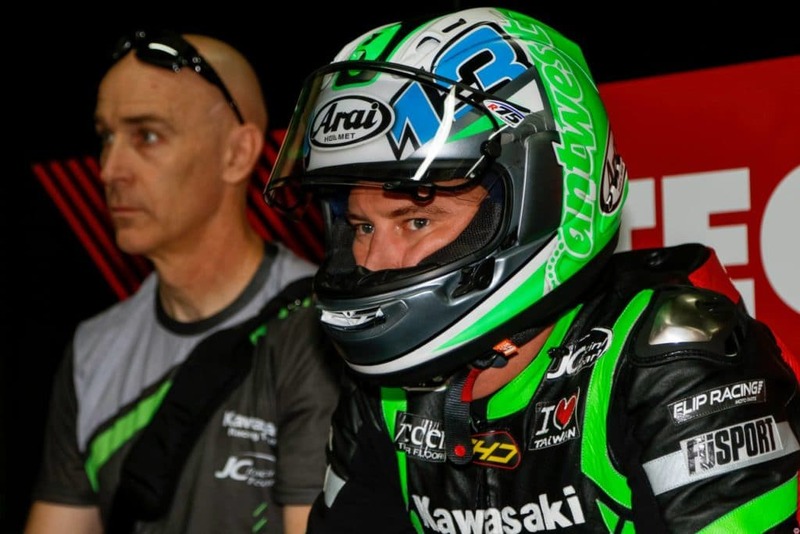 The Kawasaki Racing Team- Brasil (KRT-Brasil) squad prepared a full testing schedule to be completed when they arrived at the Interlagos circuit just outside Sao Paolo. Unfortunately, Mother Nature had other plans. The previous weekend saw the circuit hosting Lollapalooza Brazil and the ensuing rain showers delayed the break down of the stages and preparation of the track for the second round of the Brazilian Superbike Championship. The entire Thursday test schedule was scuttled by the organizers. Friday arrived and the team wanted to try and condense eight sessions into three. The team was looking for a new solution for the unique layout of the Interlagos track in search of grip. The team suffered an electrical gremlin in the form of a malfunctioning quickshifter and another entire session was lost. Eight testing sessions was now reduced to two. Saturday’s free practice saw Ant reduce his personal best lap time around the circuit to 1:36.7 and he was ready to fight for pole position in the ten minute Superpole session. Just as Ant was up to speed and ready to start his time attack, Alex Barros crashed and the session was red flagged. The session would not be restarted and Ant was relegated to fourth on the grid. Sunday morning greeted all the riders with a steady rain that drenched the track. Sunday’s schedule only allows for a ten minute warm up session. The ten minute warm up session was all the team had to test a wet setting that they developed without any on track wet testing during the weekend. Ant finished the warm up session in P1, two seconds clear of second place. The weather continued to wreak havoc on the teams plans. The rain had stopped and the track was quickly drying. When Ant came to the grid, the team discussed switching to slicks from wets on the grid. In the final moments before the race, the sky dropped a little more water and the team decided the safe decision was to stay on wets. Only one rider gambled on dry tires. Small problems plagued Ant during the race, most noticeably, a severely overheating engine and a lack of rear grip as the rear wet tire disintegrated on the abrasive Interlagos tarmac. Ant was able to defend his podium position and championship points lead when he crossed the line in third position. After receiving the checkered flag, the engine came to an abrupt halt when it locked up due to severe overheating. Well…… that weekend did not go to plan. It seemed like we were fighting issues from before the official weekend even started. Thursday testing was cancelled, we missed an entire session with a quickshifter failure, the rain came Sunday morning and the track was drying for the race. The good news is the team never stopped working towards finding solutions and we just kept trying. During the race, I realized my engine was overheating and I tried to salvage as many points as I could. I was able to hold on to third place and the championship points lead. After I finished the race, the motor made a horrible noise and just stopped. I parked my bike and had to jump on the back of a competitors bike for a ride to parc ferme.